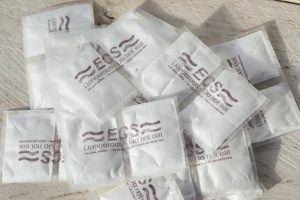 ECS sachets release gasses which migrate to the environment surrounding the food/cut flowers. Released gasses neutralize ethylene. Because of this, ethylene cannot do its harmful work on perishable products. Works up to 40 days. Optimum protection for volumes up to 1 m². No harmful or adverse side effects. ECF filters release gasses which migrate to the environment surrounding the food/cut flowers. Provides an optimum protection throughout the supply chain for volumes up to 100 m².